It is possible to improve food security in Sahel! We have all heard about Sahel, but we don’t really know where it is located and how this region is large? Check the map below for more information. 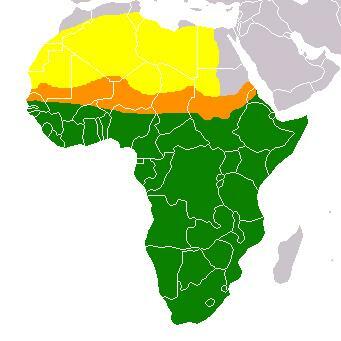 The Sahel (in orange) is the ecoclimatic and biogeographic zone of transition between the Sahara desert (in yellow) in the North and the less arid Savannah (in green) in the South. It stretches across the north of the African continent between the Atlantic Ocean and the Red Sea. The Sahel covers parts of the territory of (from west to east) Senegal, southern part of Mauritania, Mali, southern part of Algeria, Niger, Chad, southern part of Sudan and Eritrea. What characterizes the Sahel region right now? The Sahel region suffers from recurrent drought events, temperatures easily crawl into the 100s. Food insecurity, hunger, death are common. Widespread drought, high food prices and poor harvests have put more than 18 million people in a situation of starvation and over a million children at risk of severe malnutrition. But, despite this dramatic scenario of food insecurity – low rainfall and general food scarcity, some farmers have had a bumper rice yield this year. This surplus rice is no accident. Not at all! Over the last three years ACDI/VOCA (http://www.acdivoca.org/site/ID/home), an economic development organization, has helped some 10,000 farmers in the northern Segou region of the Sahel region located in Mali to make the transition from semi-nomadic livestock herders to sedentary farmers and landowners through the Alatona Irrigation Project, funded by the Millennium Challenge Account (MCA – an innovative and independent U.S. foreign aid agency that is helping lead the fight against global poverty (http://www.mcc.gov/pages/about). Like for the majority of the African countries, the inhabitants of this region depend on natural rainfall to grow crops or create viable grazing grounds. For these pastoralists, one year of low rainfall, like last year, could wipe out their animal herds and create a human disaster. Indeed, it can force them to sale their livestock on which they depend for survival at a fraction of their value because it is done in response to a crisis situation. Resettling in a new village and retraining these herders has helped them transition from a subsistence lifestyle into commercial agriculture, resulting in family economic stability and regional food security. How did they achieve these objectives – family economic stability and regional food security? Each of the resettled families will receive title to five hectares of irrigated land (which is significantly superior to the average farm size of one hectare that a large majority of the farmers own in Mali), new housing and improved access to fresh water supplies, primary education for children, and health clinics. Improving the quality of life of the whole family and breaking the intergenerational poverty cycle are important! Working with local organizations, ACDI/VOCA helps train the new farmers to grow rice with careful irrigation, soil conservation and fertility practices. The farmers are also diversifying and selectively marketing second-season cash crops. More specifically, ACDI/VOCA is organizing the distribution of agricultural starter kits to ensure success for first-time rice farmers. The kits include oxen, plowing equipment, wagons, fertilizer and certified seed. ACDI/VOCA will also provide kits for a second dry season vegetable crop exclusively for women farmers. In addition to rice, farmers are exploring markets for shallots, potatoes and forage crops for livestock feed. Perhaps most importantly, these new farmers are learning water management, hydraulic systems, irrigation and drainage techniques as well as the best practices in terms of maintenance of a network of canals. Access to water, appropriate equipments, technologies, savoir faire and local capacity building for long-lasting outcomes as well as diversification of the production are the keystone of any successful farming project! As a result, Alatona farmers are producing 5.2 tons per hectare and making on average $1,000 per hectare in a country where average annual incomes are measured at $700 per year. This project is designed to go beyond food subsistence and move into agribusiness, where farmers can invest in small threshing machines, de-hulling machines and motorized tractors. It integrates financial services, irrigation development and women’s gardens into its agricultural training program. It fosters sustainability by helping producers form farmer organizations that have market advantage whether buying farm inputs or selling the crops. Challenges still exist for the Alatona Irrigation Project, such as maintaining long-term soil fertility, sustaining the canal infrastructure, transferring know-how to younger generations and coping with the current political instability in Mali. You will find some really interesting articles….